About this Book... SOON TO BE A MAJOR MOTION PICTURE STARRING JULIA ROBERTS, OWEN WILSON, AND JACOB TREMBLAY Over 6 million people have read the #1 New York Times bestseller WONDER and have fallen in love with Auggie Pullman, an ordinary boy with an extraordinary face. With more than 6 million copies sold worldwide and over fiveyears as a New York Times bestseller, Wonder has inspired countless readers to reflect on their actions and to Choose Kind. 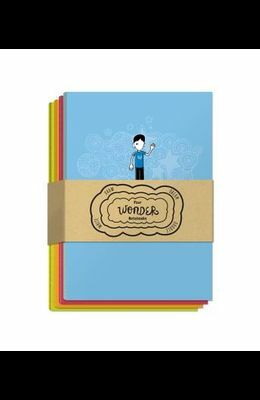 These notebooks--one lined, one blank, one bulleted, and one graph--are a colorful gift for Wonder fans, a useful back-to-school purchase, and colorful merchandise that can be traded among friends. With one blue, one red, one yellow, and one green cover, these notebooks will appeal to Wonder fans of both genders.